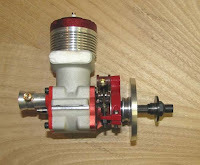 I bought an aluminum 2-1/4" TruTurn spinner for use on the Sailplane's McCoy 60. I sent the spinner nut to Bob Beecroft in California for some machining modification. 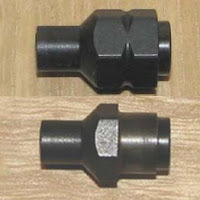 The stock spinner nut is shown in the upper part of the picture below. As you can see, Bob machined part of the hex down as shown in the lower part of the picture below and made a special prop washer to fit it. 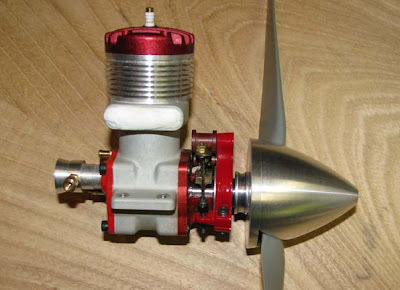 Woody Bartelt made a special keyed prop drive spool that was only 0.27" thick as shown below, which was required to properly position the 12 X 4 APC prop relative to the front of the Sailplane's cowl. This shows these three machined parts on the shaft of the McCoy 60 along with the TruTurn spinner back plate. This picture shows the machined spinner nut tightened down on the 12 X 4 APC prop. I have a the same engine. Did yours not have the timing stem? Mine does not have one either.